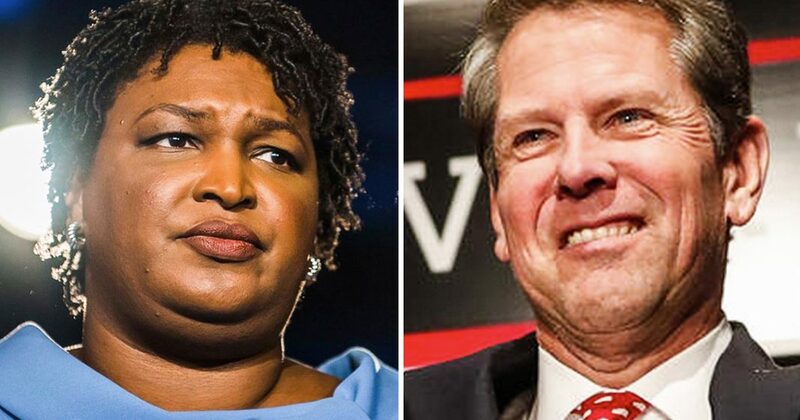 More and more information continues to pour out about the election process in the State of Georgia where a recount or run-off is basically triggered at this point because the margin between Stacey Abrams, the Democrat and Brian Kemp, the corrupt Republican have gotten so close that it triggers that automatic run-off. Here’s the thing though. It didn’t have to be this way. It’s only this close because Republicans decided to make it this close. Otherwise Stacey Abrams would already be confirmed as the next Governor of the State of Georgia. And here’s how we know that. Reports began coming out yesterday that over 1000, some estimates up to 1500, voting machines in three counties in the State of Georgia, almost 1500 locked away so that nobody could use them. These were the three counties that also suffered from the longest wait times, some three to four hours. They all happen to be counties that were heavily Democratic leaning for Stacey Abrams, so it cost her a lot of votes. The counties are Cobb, De Kalb, and Fulton. Those three counties that did not have enough voting machines, that did not have enough extension cords for the very few voting machines they have, those were the three counties that were starved of these 1500 voting machines that were locked away so that they couldn’t be used. Now here’s what state election officials are saying about those machines being locked up. “You know, this wasn’t to keep people from voting.”, they said. It’s because there was a court order not that long ago that says they have to sequester some of their machines because they need to be evaluated because they’re very vulnerable to hacking and there’s a lawsuit going on about that right now. The only problem is no judge ever said you had to sequester all of them, that you had to lock them all away or that you had to short your polling places in order to put these machine in safe place until they can be evaluated. They’re absolutely lying in the State of Georgia right now about what the courts ordered them to do. It’s not true. If they were short on voting machines all they had to do was tell the courts we do not have enough. We have no choice but to use these and their request would have been allowed. They didn’t do it because they knew that having too few voting machines was going to benefit the Republicans and so it has. This election would not be close right now. We would not be headed for a run-off with Brian Kemp in the the lead had these voting machines and all of these precincts in these heavily Democratic counties been properly equipped to accommodate the number of voters that they knew were coming. And that’s the other part of the story here. They knew they were going to have historic voter turnout in those areas. They knew the Democrats were energized. They knew they wanted to vote so they did everything that they could to prevent them from being able to vote. This is an absolute conspiracy and part of it actually involves the Republican Brian Kemp who is running for Governor. This is corrupt. This is criminal and 100% of it with by-design to make sure that Brian Kemp became the next Republican Governor in the State of Georgia.